ONE OF THE MOST INTERESTING modules I teach in the Limerick Institute of Technology invites students to dive into The Inevitable by Kevin Kelly and then emerge with thoughts concerning the effects technology has on our daily lives. We break down the exercise with a series of deep dives and structured discussion. Here is a listing of tasks students must accomplish in order to pass the module. We have the book in the library stacks and several audio clips that deconstruct each of the 12 chapters. I ask students to consider three of the chapters from the text and then develop those ideas into a major essay. I need to see an outline of their thoughts shared on a personal OneNote page called "Inevitable Rundown" as they start the process. We use Classroom OneNote for this purpose and students have their own private space for their rundown notes. Students share three different artefacts from each of the chapters they read in The Inevitable. These are objects they might have used during the past 30 years or objects that have special significance when considering the context of the chapters they read. I ask for an essay (1500-2500 words) that explains the roles represented by each of the three artefacts chosen by students. The essay should include an image of each artefact. At least five references should be cited in the essay. I stay totally paper-free in this tasking because I want students to save their essays into a shared OneDrive folder where they can see and review the work of others. 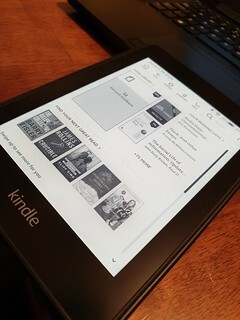 We have some hands-on Kindle publishing during tutorial sessions but in the case of The Inevitable taskings, I'm keen to have students share their completed Word document directly to my Kindle Paperwhite by having them send to my private Kindle address with the subject heading "Three Artefacts". Listen to "We Live With Our Filters with Libby O'Connor" on Spreaker. Finally, students need to sign up for a free Spreaker account and then produce a four to six minute audio summary of their work. They should include a title, cover art, and a description to the work they create. They need to license their work in their Spreaker clip as part of the Creative Commons. And they include the URL of their Spreaker episode at the bottom of the page called "Inevitable Rundown" inside the Classroom OneNote for Emerging Trends.